Isn't it pretty?? 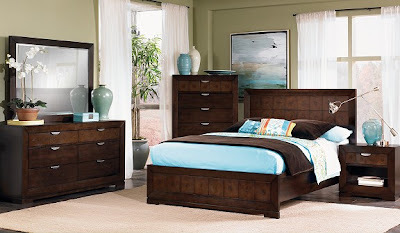 This is what our new bedroom furniture looks like and I am SO excited. I need to go home and take some before pictures because o.m.g. It looks like a mix between a college dorm and a train wreck. It is a serious disaster. I am putting a lot of energy into our bedroom and why not?! I want it to be relaxing, grown up and a place where we can just go and unwind. I plan on having all white sheets, comforter, etc. Very hotel like! Our bedroom is on the large side so I hope all of this furniture fills it up well. We also got the media center which isn't pictured. Let the fun begin!